#1 JULY 4, 1998 - FROM 10 TO 4 PM - CIRCLE LINE OF METRO FROM "DOBRYNINSKAIA" STATION TO THE "PAVELETSKAIA" DIRECTION. 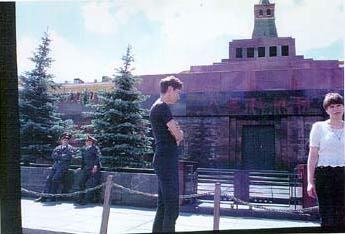 # 3 JULY 8, 1998 - FROM 11 AM TO 4 PM VDNKH NEAR "KOSMOS" EXHIBITION PAVILION. JULY 10, 1998 - SPIDER & MOUSE GALLERY, 6 - 10PM. HOME: legally the residence with a permanent address as a place architectonically defined and to be located geographically, socially the house as a social or family institution and emotionally the home as a place of belonging an emotional anchor for intimacy. "LESS" is less and still means more when used in conjunction with home. The social reality, which ART: HOME - LESS is based on, is being changed into artistic concept. That is a balancing act, seeks distance with great care, conscious of the danger of being misunderstood in the sense of a presumptuous and somewhat downplayed imitation of a group of people on the edge of existence. The formal analogy of being homeless as art and as human being is based on a truly social-critical viewpoint. There is no search for political correctness but true sympathy. something the artist shows her active commitment, her social work for homeless people, even apart form the artistic creation. The work in Moscow differs significantly in New York City, Moscow and Marseilles as the conditions of becoming and being homeless differ significantly. 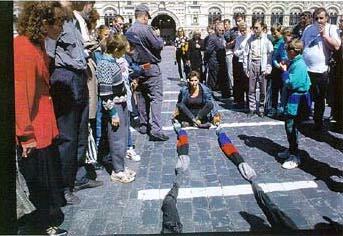 In Moscow, this means for Birgit Ramsauer to deal with massive control and exploding freedom at the same time. 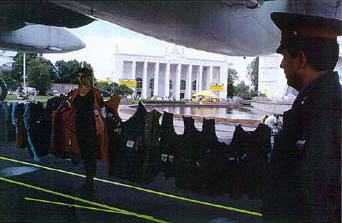 Therefore, she turns herself into a part of the installations-actions, and concentrated on one single "material" : CLOTHES. 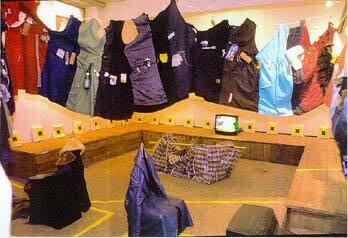 The artist puts herself into clothes with overdimensional parts, like for example, 6-meter-long sleeves. This hinders certain movements of the artist as well as of the people trying to pass by. Interactions with "control" and "freedom" appear. Eventually, these forces change - not to destroy! - the installation-action its final destruction. It is not possible to separate social and artistic commitment in Birgit Ramsauer's project ART: HOME-LESS. On contrary, they merge into a complex structure, in which social and artistic questions form an inseparable unit, which consequently displays the link between art and life, so often evoked in the past, as a living environment. Birgit Ramsauer (based on an essay by Claudia Schmuckli, Guggenheim Museum Soho, NYC).